a plasma protein of 110,000 molecular weight that normally exists in plasma in a 1:1 complex with prekallikrein. 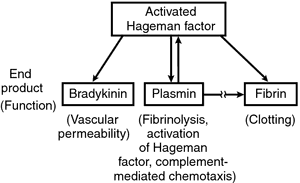 The complex is a cofactor in the activation of coagulation factor XII. The product of this reaction, XIIa, in turn activates prekallikrein to kallikrein. a high-molecular-weight kininogen that may be required for the interaction of factors XI and XII in the coagulation process. a high-molecular-weight kininogen; a blood clotting factor.